The factors affecting efficacy in non-starch polysaccharide (NSP)-degrading feed enzymes remain subject to considerable confusion, despite increasingly widespread use within the poultry and swine sectors, writes Dr Craig Wyatt, AB Vista Poultry Technical Manager. Yet achieving a consistent response relies on a detailed understanding of both the numerous enzyme characteristics that contribute to efficacy, and the various interactions with the substrates being targeted. Given that the most abundant of those targets is the hemicellulose NSP fraction arabinoxylan (often referred to as xylan), it is no surprise that xylanase-based products account for more than 80 per cent of all NSP-degrading enzyme sales globally. One of the main challenges, however, is that this substrate varies considerably. At the most basic level, xylan is composed of differing numbers of xylose sugars, with zero, one or two arabinose side-chains. The xylans in cereal grains tend to contain high numbers of arabinose side-chains (making them highly ‘substituted’) with significant differences occurring between cereal varieties, across growing seasons and from one location to another. The more highly substituted a xylan is, the more water-soluble it tends to become, and the greater the negative impact on digesta viscosity (caused by high levels of soluble long-chain xylans). The level of substitution also influences where any ‘cleaving’ of the xylose backbone by a xylanase enzyme can take place. It is a good example of how key xylanase characteristics dictate both how and where the enzyme can act, as well as the end-products subsequently produced. For example, endo-acting xylanases cleave the xylose backbone mid-chain, whilst exo-acting xylanases release free xylose or arabinose sugars from the ends. Even within endo-acting xylanases, there are important differences, such as the presence, or absence, of the ability to cleave the xylose backbone adjacent to an arabinose side-chain, or break it down beyond a certain size. Such differences are important. The break-down of long-chain soluble xylans by endo-acting xylanases is the primary mechanism by which digesta viscosity is reduced in viscous diets. The same effect simply cannot be achieved rapidly enough to prevent digestion being disrupted if using exo-acting xylanases, or if the dose of endo-acting xylanase is insufficient or poorly targeted. 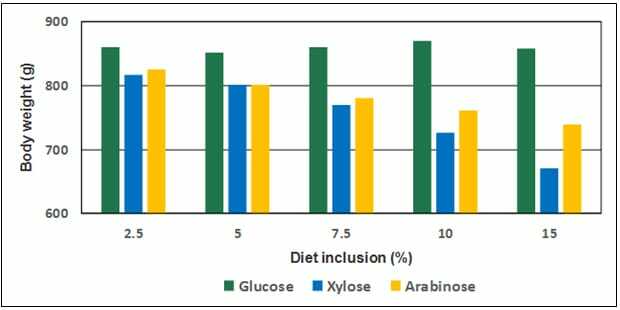 It is also now recognised that high concentrations of free xylose and arabinose released by exo-acting xylanases can be detrimental to animal performance (Figure 1), as neither the xylose nor the arabinose sugars can be digested. Contrary to what some might think, complete xylan degradation is therefore not desirable, and should not be the target for xylanase use, whether through additional enzyme activities or by over-dosing. Instead, it appears that the greatest performance benefits arise when the products generated by xylan hydrolysis are specific arabino-oligosaccharides (AXOS) that have the potential to act as a prebiotic within the animal. This is now recognised as one of the main mechanisms by which xylanases can improve nutrient digestibility and animal performance in non-viscous, corn-based diets, as well as contributing to responses in viscous diets. Yet this effect can only be achieved through use of endo-acting xylanases, and only those that are correctly matched to the substrate and end-products being targeted. Such specificity, including the point at which the xylan backbone is cleaved and the extent of xylan breakdown, varies considerably between xylanases. This directly affects not only prebiotic AXOS production and survival, but also digesta viscosity, particularly if poorly targeted breakdown of insoluble xylan increases the overall level of soluble xylan present. The key is to ensure that the right dose of the right xylanase is applied, and that it arrives in a still-active state at the point of action, namely the stomach and small intestine. Characteristics such as the ability to survive the acid conditions and digestive enzymes (mainly pepsin) of the stomach, a high level of activity between pH3 to pH6 and at around 104°F (40°C), and thermostability to survive high temperature feed processing and pelleting are therefore vital. Overall efficacy can also be negatively affected by the presence of poorly defined or undeclared side activities which may take xylan degradation too far. What is clear, however, is that where a high efficacy xylanase is correctly targeted, the response is not only significant statistically, but also commercially, whether in wheat-based (see Figure 2a) or corn-based diets (see Figure 2b). When correctly managed, such performance responses are also consistent across different seasons, and are capable of more reliably providing the expected return on investment. Choosing a xylanase with the right characteristics to achieve the desired result is essential, and understanding the characteristics that matter is undoubtedly the key to getting that choice right.